Why is Your Bank Password Safe? Mix one part of blue and one part of yellow to make 2 parts of green: a primary school art teacher writes this on the blackboard during a painting class. The students in the class then curiously try this trick and Voilà! they see green colour emerging from nowhere out of blue and yellow. One of the students after exhausting all her supplies of blue and yellow curiously asks the teacher: how can I extract the original yellow and blue from my two parts of green? This is where things get interesting, it is easy to mix things however it is really difficult (sometimes impossible) to reverse the process of mixing. The underlining principle at work over here is entropy (read the article on decision trees and entropy); reducing entropy (read randomness) requires a lot of work. This is essentially the reason why time series are difficult to decipher, and also the reason why your bank password is safe. Cryptography, the science of hiding communication, is used to hide secrets such as bank passwords or credit card numbers and relies heavily on the above property of mixing being easier than “un-mixing”. When you share your credit card information on the internet it is available on the public domain for anybody to access. However, what makes it difficult for anyone without the key to use this information is the hard to decipher encryption. These encryptions at the fundamental level are created by multiplying 2 really large prime numbers. By the way, a prime number (aka prime) is a natural number greater than 1 that has no positive divisors other than 1 and itself. Now multiplication of two numbers, no matter how large, is a fairly straight forward process like mixing colours. On the other hand, reversing this process i.e. factorizing a product of two large primes could take hundreds of years for the fastest computer available on the planet. This is similar to “un-mixing” blue and yellow from green. You could learn more about cryptography and encryption by reading a fascinating book by Simon Singh called ‘The Code Book’. Back to our case study example, you are helping PowerHorse Tractors with sales forecasting (read part 1). As a part of this project, one of the production units you are analysing is based in South East Asia. This unit is completely independent and caters to neighbouring geographies. This unit is just a decade and a half old. In 2014 , they captured 11% of the market share, a 14% increase from the previous year. However, being a new unit they have very little bargaining power with their suppliers to implement Just-in-Time (JiT) manufacturing principles that have worked really well in PowerHorse’s base location. Hence, they want to be on top of their production planning to maintain healthy business margins. Monthly sales forecast is the first step you have suggested to this unit towards effective inventory management. In the remaining article, we will study each of these components in some detail starting with trend. Now, let’s try to remove wrinkles from our time series using moving average. We will take moving average of different time periods i.e. 4,6,8, and 12 months as shown below. Here, moving average is shown in blue and actual series in orange. 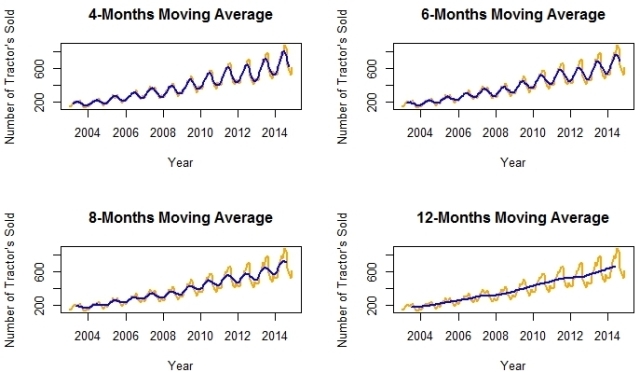 The first thing to do is to see how number of tractors sold vary on a month on month basis. We will plot a stacked annual plot to observe seasonality in our data. 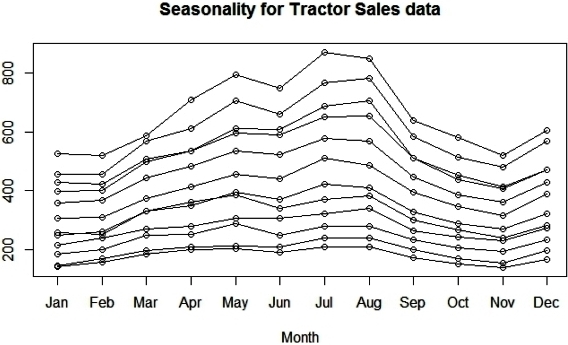 As you could see there is a fairly consistent month on month variation with July and August as the peak months for tractor sales. Instead of multiplicative model you could have chosen additive model as well. However, it would have made very little difference in terms of conclusion you will draw from this time series decomposition exercise. Additionally, you are also aware that plain vanilla decomposition models like these are rarely used for forecasting. Their primary purpose is to understand underlying patterns in temporal data to use in more sophisticated analysis like Holt-Winters seasonal method or ARIMA. 1) Trend: 12-months moving average looks quite similar to a straight line hence you could have easily used linear regression to estimate the trend in this data. The expectations from remainder component is that it should look like a white noise i.e. displays no pattern at all. However, for our series residual display some pattern with high variation on the edges of data i.e. near the beginning (2004-07) and the end (2013-14) of the series. 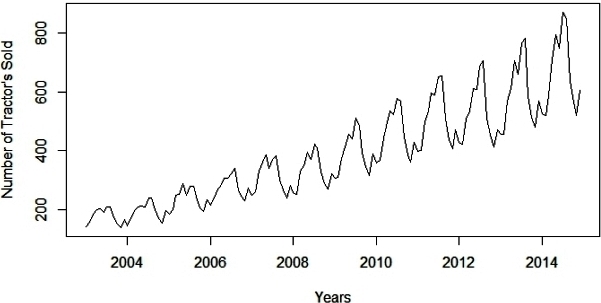 White noise (randomness) has an important significance in time series modelling. In the later parts of this manufacturing case study. you will use ARIMA models to forecasts sales value. ARIMA modelling is an effort to make the remainder series display white noise patterns. It is really interesting how Mother Nature has her cool ways to hide her secrets. She knows this really well that it is easy to produce complexity by mixing several simple things. However, to produce simplicity out of complexity is not at all straightforward. Any scientific exploration including business analysis is essentially an effort to decipher simple principles hiding behind mist of complexity and confusion. Go guys have fun unlocking those deep hidden secrets! I read both parts of Time series analysis and believe me I have never gone through any explanation on time series which is so simple to understand before. Thanks for keeping things so simple and yet interesting. However, I have one request, would it be possible to have the dataset of this example (or something new) and built the model (ARIMA and/or Holt Winter’s model) to understand the benefits and challenges? 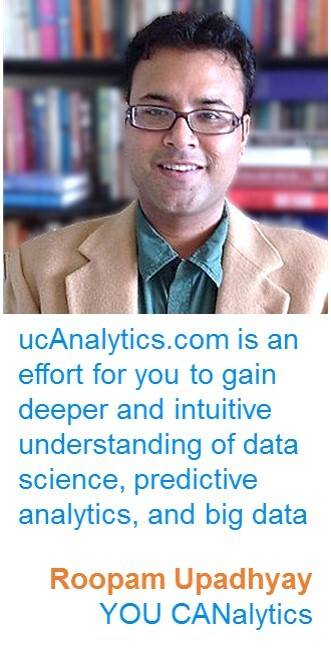 Thanks Anirudh, I will share datasets when we will get to ARIMA modeling. I found the material very clear and easy to understand. I would be very grateful if I could get pdf copies of both parts for my own research. Thanks Willis, I post my contents directly on YOU CANalytics. Don’t have these posts in PDF format. I suggest you read all the 5 part of this case study. You will certainly find them helpful if you found the first two part useful. You could find them all on this link. hi…this looks very simple to understand…thanks for posting. It`s ridiculous to classify your articles/blogs as Awesome,good and bad. The content is well structured and doses of philosophy at the beginning and end are like adding ad-ons (Garlic bread and Soda with Cheese Burst pizza). Coming back to this article, I just wanted to ask on how to choose between additive and multiplicative decomposition models. One way I know is when seasonality itself has a trend in it, then we go for multiplicative. 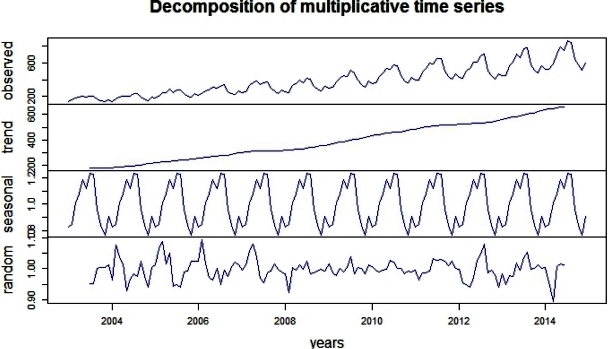 But in R, there`s no way to determine it(decompose(time_series, method=”mul” or “additive”). 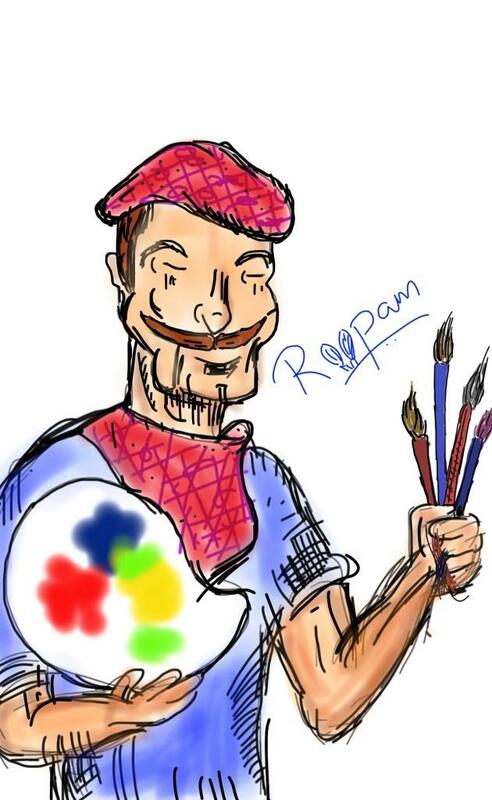 hi Roopam…this looks very simple to understand…thanks for posting. Can you please illustrate how the seasonality was calculated to calculate remainder?? Trying very hard to understand the ARIMA time series, please help in understanding the same with real time examples. Cycle refers to business or economic cycles where the economy goes through patches of periodic ups/downs i.e. recession etc. In theory, cycles happen every 7 years or so. For practical purposes, most business problems don’t involve modelling cycles because one tries to forecast for short duration (couple of quarters) because long duration forecasts are highly fragile. Thanks a lot for explaining this, some terms are not much feasible for non native speakers! Does it mean that the season graph repeats exactly after 12 months? Yes, that is correct. Seasonality is usually associated with factors such as production cycle, holidays, weather conditions etc. These are recurring events. In terms of analysis, yearly or hourly data is not very different as long as the intervals are consistent across the data. Also, you may want to check for seasonality if it makes sense for your problem and then use as many seasons as possible. I would assume seasonality is important for wind. All the best.